What to do in Madrid in 2 days is a matter difficult to solve, there are so many places to visit! In this article we give you some advices that will be useful for you in where to go and what to see depending on your likes. First of all, if you are going to stay in Madrid for only two days, we recommend that you focus on the city. The Community of Madrid, which is the region where the city is located, has many points of interest. The Royal Site of San Lorenzo de El Escorial, the Royal Palace of Aranjuez or Alcalá de Henares to name a few. Going there would take one day, so you could run out of time if you try to visit everything. 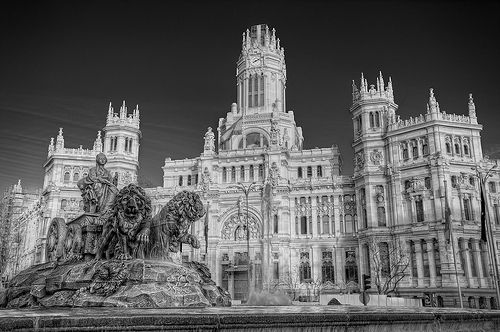 In your two days travel to Madrid, you must not foregot a couple of walking tours. The first one is the Austrians Madrid tour. This takes you to the oldest part of the city, developed under the reign of Habsburg dynasty. Madrid was always a small village, even when it became capital in 1561. You will have the amazing opportunity to visit many places that have remained the same over the years with the narrow streets, ancient buildings and famous monuments. In this tour you will discover the picturesque square of Plaza de la Villa, the heart of the Medieval Madrid Plaza de la Paja, Vistillas Gardens where you will discover the best view of the Cathedral, and the Plaza Mayor, which is the symbol of this borough. Although we cannot talk about a ‘Bourbons borough’ in the city, there are very important places in downtown Madrid, that speaks clearly about the style of this dynasty that has definitely changed its look. The most important building is, without question, the Royal Palace. This great building was erected in the mid 18th century in an Italian Baroque style and it includes hundreds of exclusive rooms and two quiet gardens. Puerta del Sol is a square formed in the late 18th century and it is considered to be the real centre of Madrid. In fact, in this place, is located a plaque that marks the Kilometre 0 of the country. In Calle Alcalá you will also find many monuments promoted by the Bourbons: the Royal Academy of San Fernando, Cibeles square with the Communications Palace standing out and Alcalá Gate, a Neoclassic monument ordered to be built by Charles III, probably the best Spanish king ever. Right behind Alcalá Gate you will enter into the nicest green area of the city, the Buen Retiro Park. Madrid is one of the capitals of the culture in Europe. If you love are and are wondering what to do in Madrid in 2 days , you must know that some of the most interesting museums are located in this city, especially around the area called The Golden Triangle of Art. This area gathers three major museums: the Prado, the Thyssen-Bornemisza and the Reina Sofía. Completing each other by picking up where the other left off, if you can’t find it in one, you will in the other two. . The Prado Museum is the most visited. Its collection was formed thanks to the Spanish kings who loved to collect paintings. Velazquez, Goya, Murillo, Caravaggio, El Greco, Hyeronimus Bosch and Tiziano are some of the masters present in this gallery. The Reina Sofia Museum focuses on modern art, displaying amazing paintings by Picasso, Dalí, Miró, Ernst, Magritte, Bacon and Gris. Its best work is clearly Guernica by Picasso. Meanwhile, the Thyssen-Bornemisza Museum gathers paintings of all the periods, from Gothic through the Avant-Garde movements. In a visit of two days, you should visit one or both of the most powerful Madrid attractions, its football stadiums. On the one hand, the Santiago Bernabeu is the home of Real Madrid, the richest club in the world. It has a 85,000 seating capacity and stars like Cristiano Ronaldo and Gareth Bale play on its grass. Then on the other hand, the Vicente Calderon is the stadium of Atletico de Madrid, which is the club in vogue in Spain. It is classified as a 5 star stadium and it is famous because their supporters are the warmest of the country. Among all of this, you have other chances for leisure, such as the theatres of Gran Via and the bullfighting in Las Ventas, whose season begins in March and finishes in October. As you see, you will have many chances to solve your (nice) problem of what to do in Madrid in 2 days.